A bit of back story first. I struggled with infertility for three years before conceiving a baby. The cause of the infertility was hypothyroidism, which I began treatment for five months before conception. Unfortunately my hypothyroidism was not well managed during my pregnancy, and I miscarried at 9 weeks. I then had another miscarriage at 5 weeks right after that. The main lesson these experiences taught me was to not simply trust doctors. After doing hundreds of hours of my own research, I started my own treatment program of diet, exercise, and thyroid treatment, supported by a naturopathic thyroid doctor. Five months later I conceived. Though the pregnancy by all indications was progressing perfectly, I nonetheless was experiencing a great amount of fear. The miscarriages had been really hard on me and my husband, and it was all I could do to keep myself in a state of mind that was best for me and my growing baby. A friend of mine had mentioned hypnosis for childbirth (Hypnobirthing), and since I knew I wanted a natural childbirth I went online and found the Hypnobabies program. I started the program at 22 weeks, and it really helped calm my fears and teach me to really relax. I loved my daily training sessions! I started sleeping better (I had had major sleeping problems ever since my first pregnancy) and learned techniques to deal with my (often irrational) fears. At 10 am, 40w4d, my water broke. 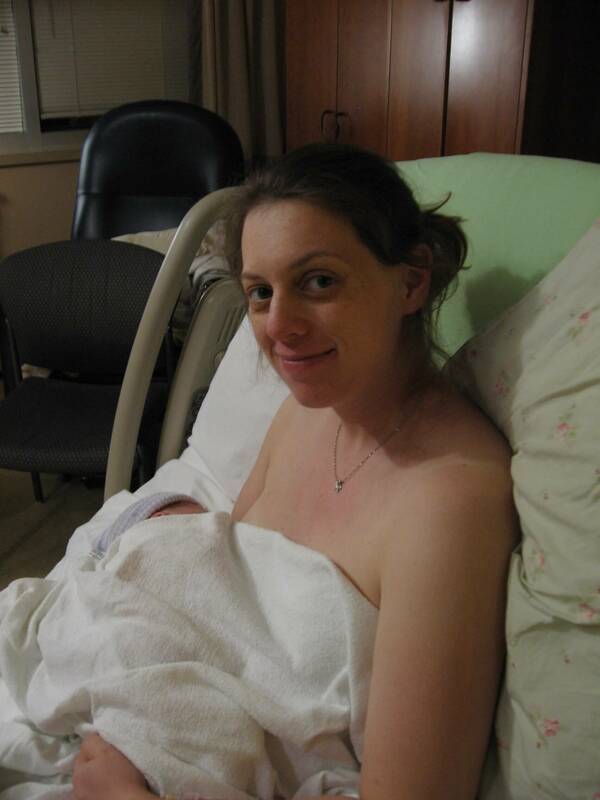 My whole pregnancy I had been terrified of being induced, and as the day went on and no signs of labour appeared I began to think I would not be having the natural childbirth I wanted (I had an OB/GYN and was planning a hospital birth). I had been listening to birthing day affirmations and ‘baby come out’ for about a week already, and that day I listened to ‘easy first stage’ as well. I talked to my doula, who is also a labour and delivery nurse and first time hypno-doula, and we decided to wait it out until the next morning and then reassess. I ate some spicy food and went to bed. At 10 am the following day, still no sign of labour! I called my doula, who suggested that I call this wonderful midwife with a home-birth practice that we had happened to meet the previous week. I called the midwife, who was full of advice and gentle encouragement, and she said she had never had a problem with infection in women who did not give birth within 24 hours of their water breaking. I called my doula who had done more research, and she also thought that waiting it out would not pose too great a risk. It seemed that the key was avoiding germy hospitals and constant cervical checks! We also agreed to lie to the hospital about when my water had broken so that I wouldn’t be treated as high risk (I justified this to myself in part by the fact that in England, women can go to 72 hours before being induced!). Since I was willing to lie by 24 hours but not by 48, I wanted to get things started. At 12:30 pm that afternoon I tried castor oil. I went to bed and listened to ‘easy first stage’ to wait it out. By 3 pm I was having major diarrhea. By 3:30 I was having pressure waves and thinking “this might be it!”, but still in major doubt about whether my birthing time was actually starting. The diarrhea was very unpleasant; the pressure waves felt like practice waves + menstrual cramps. I decided to call my doula to give her a heads up, and she decided to come over. By the time she got to my house, around 4:30, it was pretty clear that this was in fact it! I put on “easy first stage” and mostly used my ball. In the next hour or so it also became clear that I was experiencing a lot of pressure in my back. I was really only comfortable in hands and knees and on my birthing ball. My husband and doula took turns putting counter pressure on my back. It took a great deal of concentration to get through each wave, since I was not mentally prepared for the back pain (the baby had been anterior since 29 weeks and I had done a great deal the whole pregnancy to ensure proper positioning, but he must have turned posterior just as it started to descend). By 6:30 pressure waves were coming about 3 minutes apart and lasting around a minute. I think it was 7:30 when we decided to head to the hospital, since I had become fixated on getting in the tub. In the car, I used the off position to great effect, since I had 3 pressure waves on the 5 minute drive. In the parking lot I and on the way in I used my ball. By this point I had my iPod on playing hypnobabies tracks. A nurse was asking me questions, and when she asked how I envisioned my labour and delivery experience, I said, “I just want to be left alone.” After the nurses had read my birthing plan, they indeed did leave me alone (which was perfect)! I spent about 2.5 hours in triage, and when they checked me I was 4-5 cm dilated. In triage I insisted on my ball, even for the monitoring, since the back pain/pressure was so intense. The one time I swore was when I tried to lie down for a while! Though I was able to use my hypnosis just fine to have my cervix checked. By this point my arms and legs were getting pretty tired, but I just had to be in forward leaning positions. I was using centre switch but longed get into a fully supported position and switch off for a while. My wonderful husband and doula continually applied counter pressure and used the ‘relax’ cues. My doula started to suggest positions that would help move the baby out of posterior position, but I was too uncomfortable to use them. Around 11:00 we finally got to my birthing room. The nurse promptly started in on the drug spiel, and she was referred to my birth plan. When she came back she had adjusted her attitude and was great from then on (I hardly remember her being there in fact). I got in the tub and hated it! I sat on my birthing ball in the tub and my husband used the shower to spray water on my back. I was still in control as long as my wonderful, amazing birth partners were both there with me, but I was beginning to think that I just wanted a break. I had expected the pattern to be pressure wave, then break, but instead it was pressure wave with intense back pressure, then intense back pressure. About midnight I got out of the tub and laid on the bed for a bit to rest. I then remember standing by the bed and telling my doula that I didn’t think I could do this. She immediately went to get the nurse to put my saline lock in, since she expected that I was in transition (my doctor had insisted on one, and we prolonged it as long as possible). The nurse checked me and in fact I was 9 cm, and feeling pushy, though I knew I couldn’t yet push. I remembered (I think from Alexander Technique for childbirth) that panting helped to keep one from pushing, so I immediately switched to ‘hee hee ha ha’ breathing during waves. I did this for at least half an hour, but it felt like just a few minutes. Then the doctor was there and saying I was complete and could push!!! At first I used the ‘aahhh’ breathing technique to move the baby down. Other than the constant back pressure, pushing felt great! I vocalized with grunts and sometimes my ‘ahhh’s would turn into lion’s roars. Then my doctor suggested that I hold my breath in while pushing, because she thought it might be more effective. Since she physically checked a few times to see how I was moving the baby with each push, I thought I would try it, though in principle I was against “purple pushing”. The nice thing was that it was still very “mother directed”, since no one told me when to start or stop. Occasionally the doctor would ask if I had one more push in me, which I found encouraging, since I usually wanted to push once more anyways. I had been pushing for about 2 hours when I all of a sudden felt a real loss of energy. Though I had been physically very tired for a while (especially my arms and legs), this was different. I said so and the doctor suggested that I rest during the next wave of pushing. I did that as much as possible, and was able to go back to exerting myself with the next urge to push to my fullest capacity. I tried to ignore the gigantic clock they stupidly put right at the foot of the bed. At this point my husband was holding my leg (I was side-lying) and then my hand (the nurse took over my leg), and my doula was lightly rubbing my back. I watched the whole thing in the mirror which was so encouraging! I saw my doctor stretching my perineum with each push, and my baby’s hair, and I could see exactly what I was doing with each push. I kept thinking “see how much ROOM there is that the doctor is making?” When the baby crowned I indeed did feel ONLY stretching! Amazing! The most vivid thing was the feeling of bulk as the baby sat completely in my birth canal and with his head crowned at the opening. A few pushes later, 12 hours after my first pressure wave, he was out, and I heard “it’s a boy!” He had turned in the birth canal to anterior. It took a few seconds to work out how to get him onto me, since he had a very short cord. 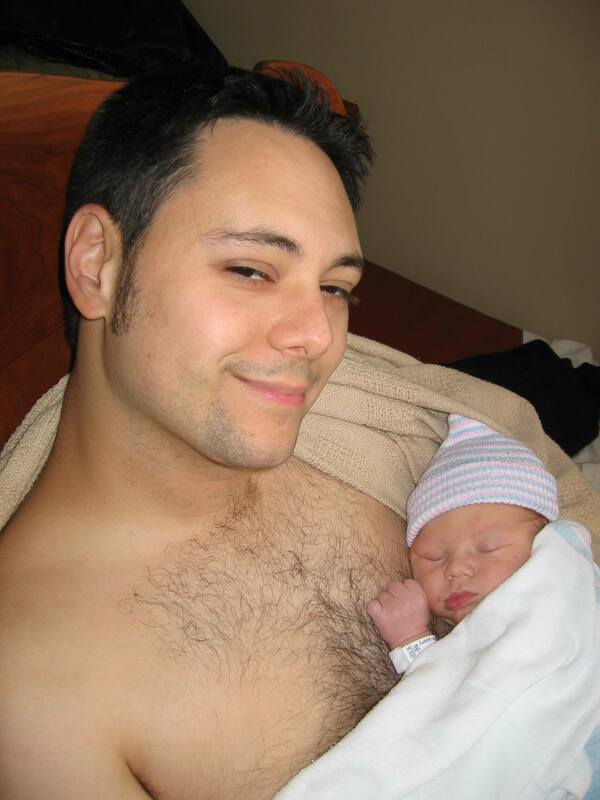 It felt like an eternity, though my husband says it was only a few seconds, and I started to cry out “let me see him!” I then let out four years of pent-up emotions with a few sobs when they put my beautiful baby boy on me. We let the cord pulse out, and then my husband cut it. When they moved him up from my lower abdomen to my chest, I spoke to him and he lifted his head and looked straight at me, and then did the same when my husband spoke! By far, the greatest thing about having a natural childbirth in my view is having an alert baby who is totally him- or her-self from the very beginning. He was a whopping, shocking 9 lbs. 8 oz. (my husband and I are not big people! ), and 21 inches. He was in great health all through birthing and after (though he had a bit of quick breathing for about 12 hours after birth). I nursed him for an hour and felt great—like I could get up and walk home! The two nurses that had attended our early morning birth were raving about how well I did, as did all the nurses I saw (they had heard about my hypnosis) during my 36 hour hospital stay. I did tear and needed stitches. While I didn’t end up with the pain-free childbirth I had been preparing for, without the hypnosis I definitely would have been climbing the walls! Instead, I was able to keep in control the whole time, maintain my demeanor, get through what was necessary (car ride, medical procedures), and not be tempted into using drugs. I was also able to really fight the urge to tense up during waves, and just relax into them as much as possible. One of the most useful techniques my first-time hypno-doula used was reminding me to relax my face. I think this really helped shorten my birthing time. Pushing felt great (other than the constant back pressure and very distracting hemorrhoids) and so did crowning! I really can’t remember what the pressure waves even felt like, since the constant back pressure was all consuming. My only experience of pain was the back pain. Looking back, the only thing I would have changed would have been my mental preparation for and early first stage physical management of my back labour. The “change of plans” script would have helped me I think. Also, though I had not been envisioning a middle of the night birth, I really ended up liking the peace and quiet. I did end up with the maximum 12 hour labour I had imagined! © Copyright 2019 by Hypnobabies LLC.